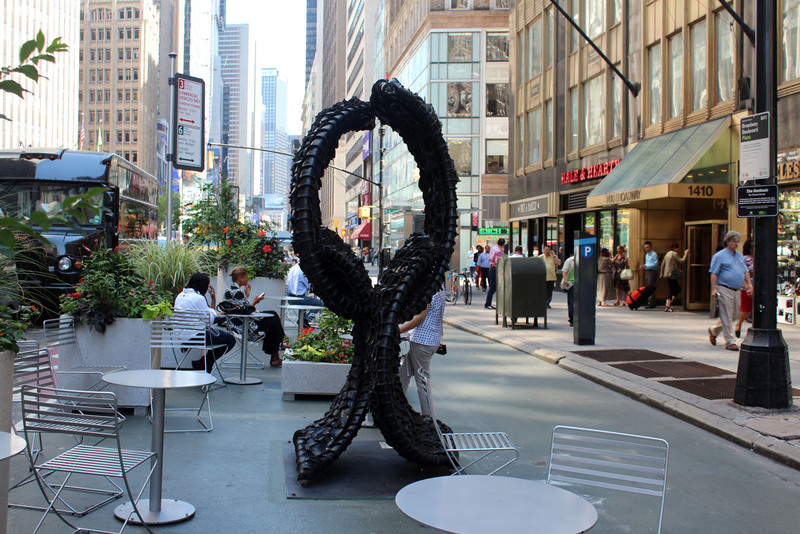 NEW YORK—Chakaia Booker uses recycled rubber tires to create the layered and textured surfaces that define her sculptures. 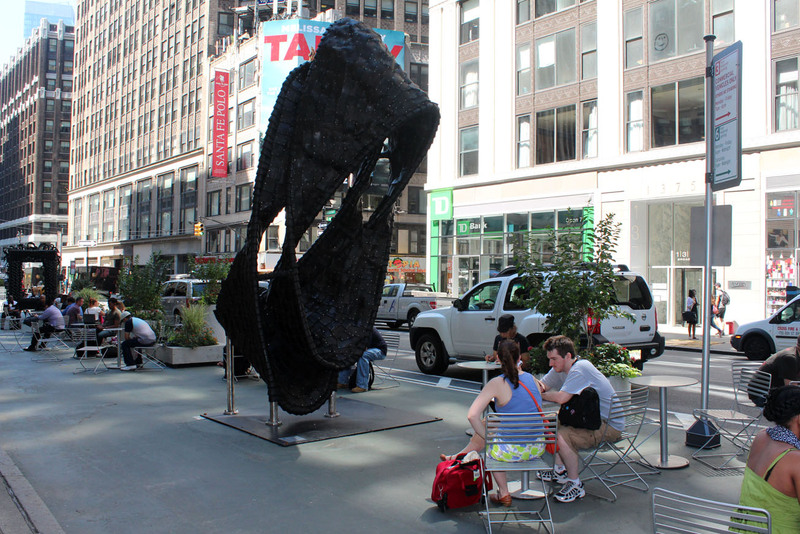 After gracing New York Avenue in Washington, D.C., with her works for two years, she installed a group of five sculptures on Broadway between 36th and 41st streets in the Garment District this spring. 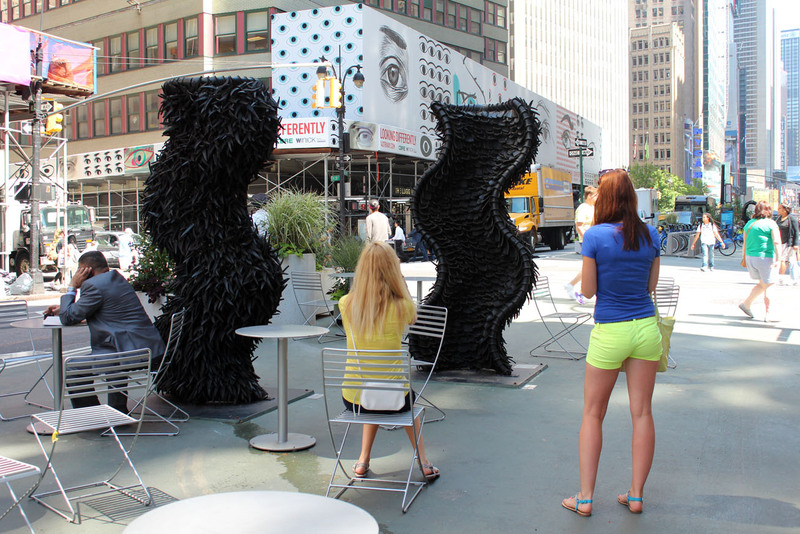 Titled “The Sentinels,” the series includes “LBD Duty Free,” a new sculpture produced specifically for her New York presentation. 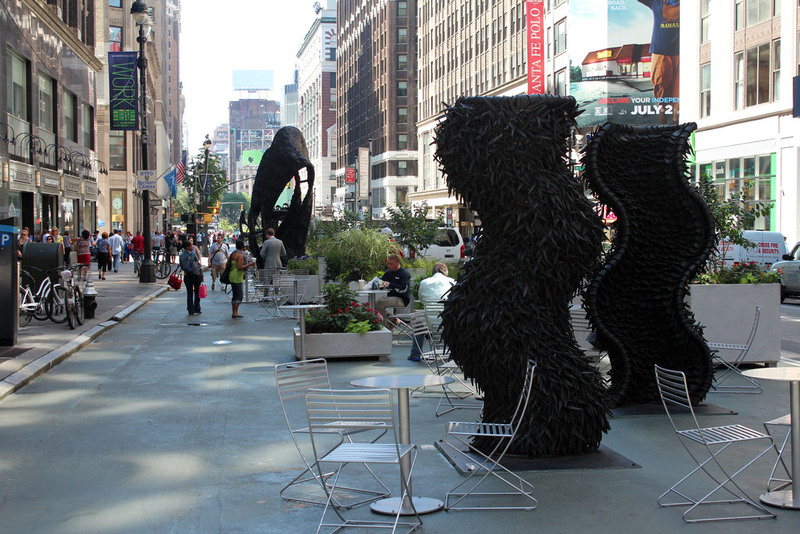 The dynamic exhibition is seamlessly integrated among the tables and chairs placed down the middle of Broadway and is one of several must-see public art installations on view in New York this summer. “One Way,” 2008 (rubber tires and stainless steel). 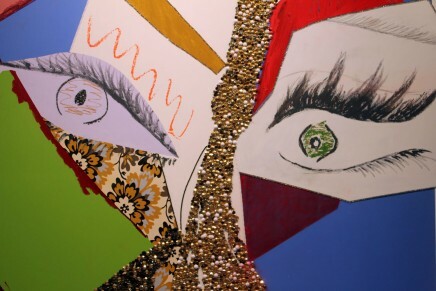 Presented by the Garment District Alliance, “The Sentinels” is on view from June 5 and is on view through mid-November 2014. 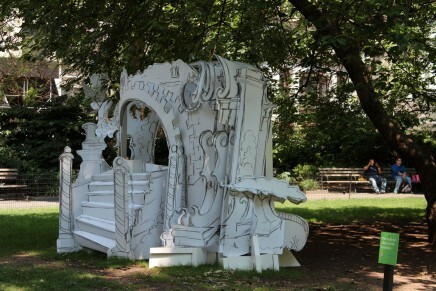 Alternative view of “One Way,” 2008 (rubber tires and stainless steel). Detail of “One Way,” 2008 (rubber tires and stainless steel). 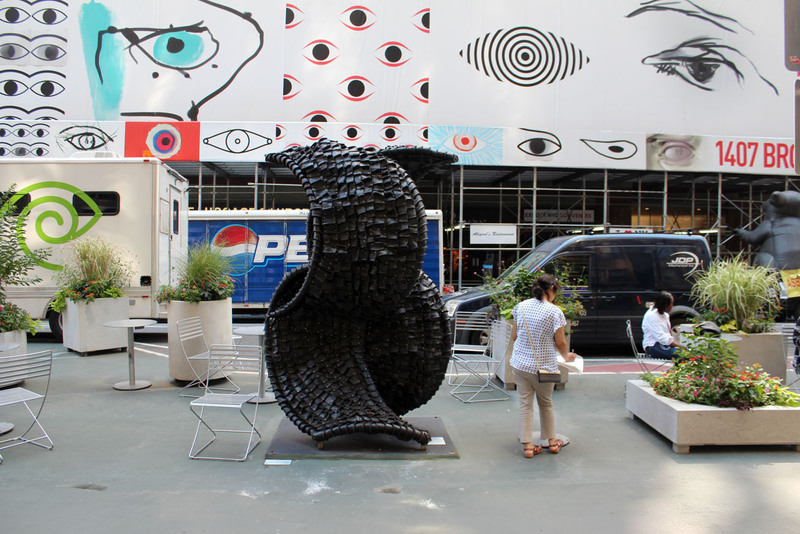 Installation view of “Shapeshifter,” 2012 (rubber tires and stainless steel), with “LBD Duty Free” in the background. 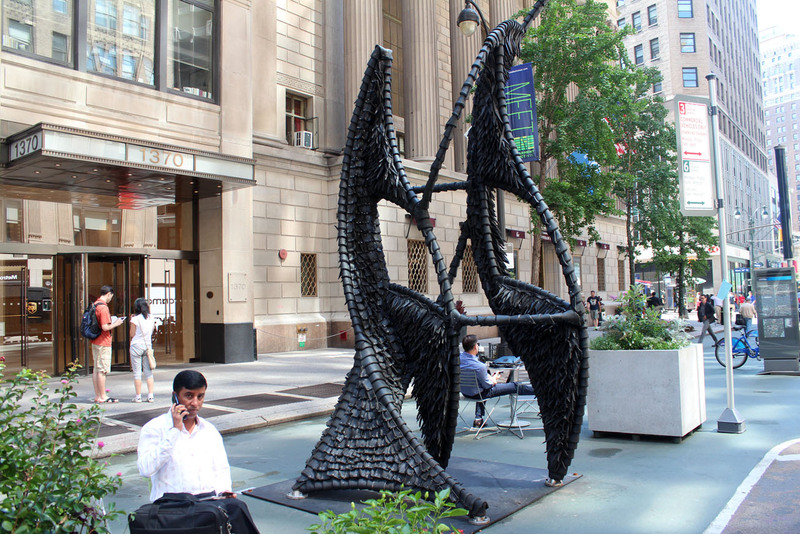 “Shapeshifter,” 2012 (rubber tires and stainless steel), also shown in detail at top of page. 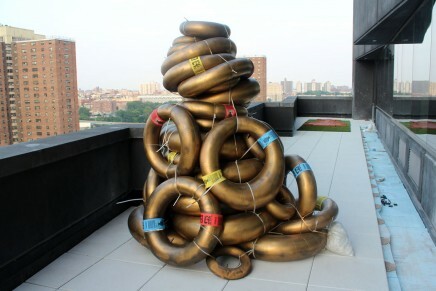 “Gridlock,” 2008 (rubber tires and stainless steel). 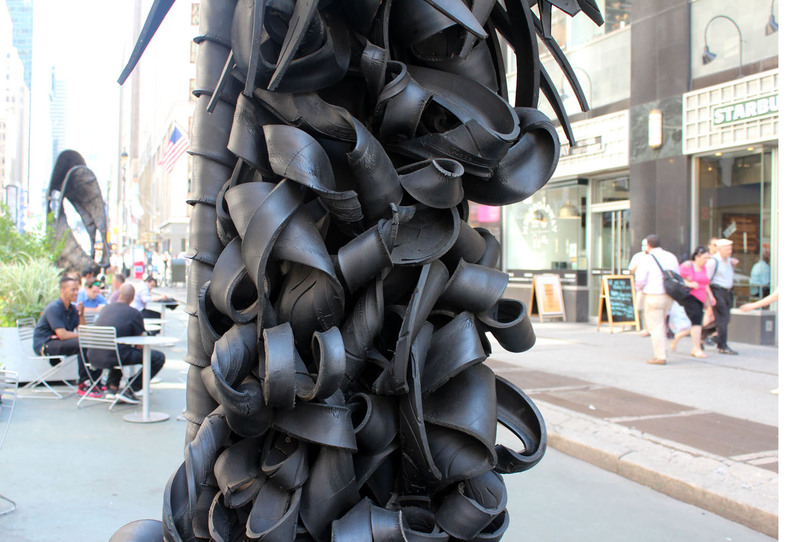 “Take Out,” 2008 (recycled tires). 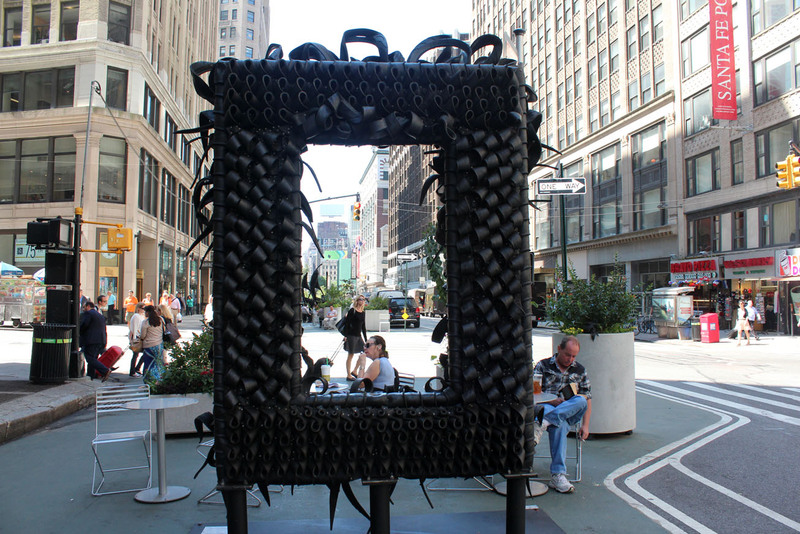 Alternative view of “Take Out,” 2008 (recycled tires). 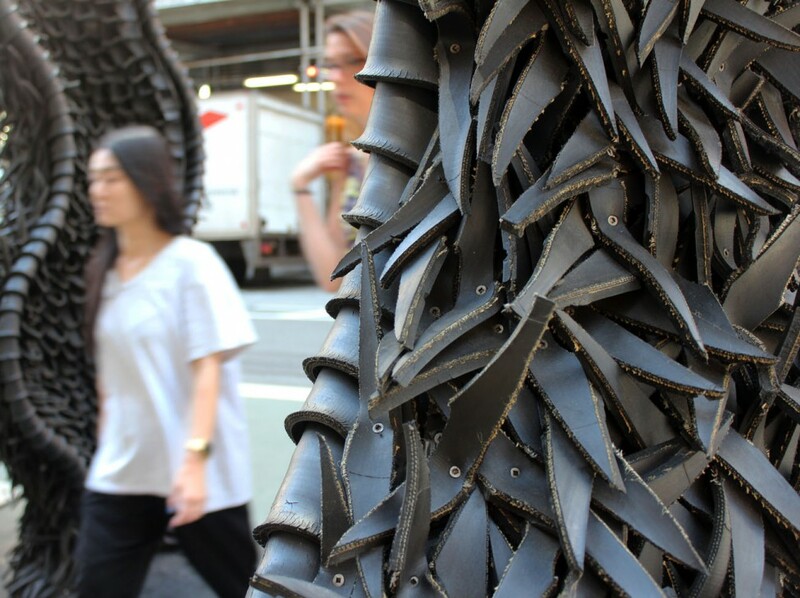 Detail of “Takeout,” 2008 (recycled tires). 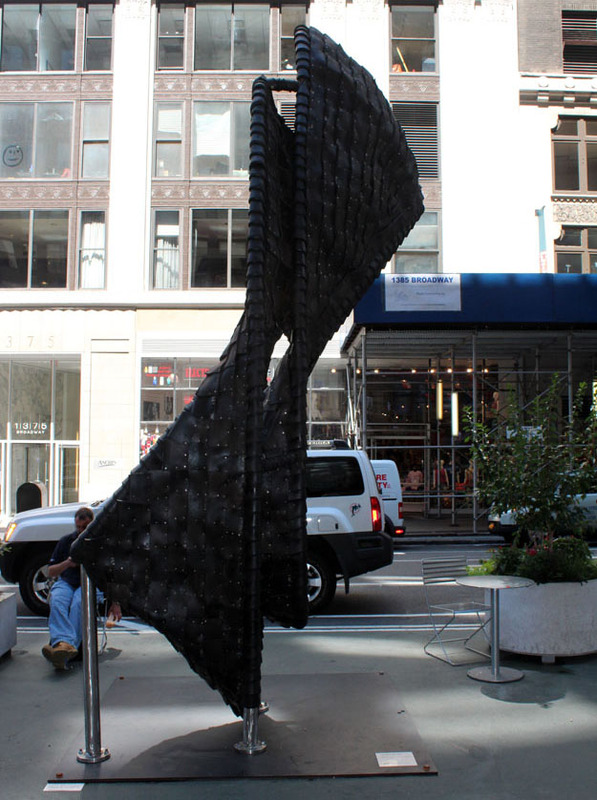 “LBD Duty Free,” 2014 (rubber tires and stainless steel), was created for the New York exhibition. 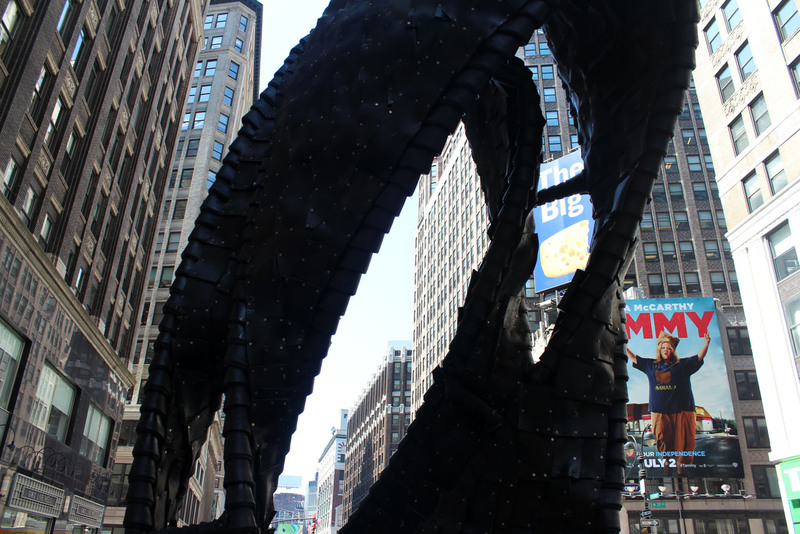 Alternative view of “LBD Duty Free,” 2014 (rubber tires and stainless steel). 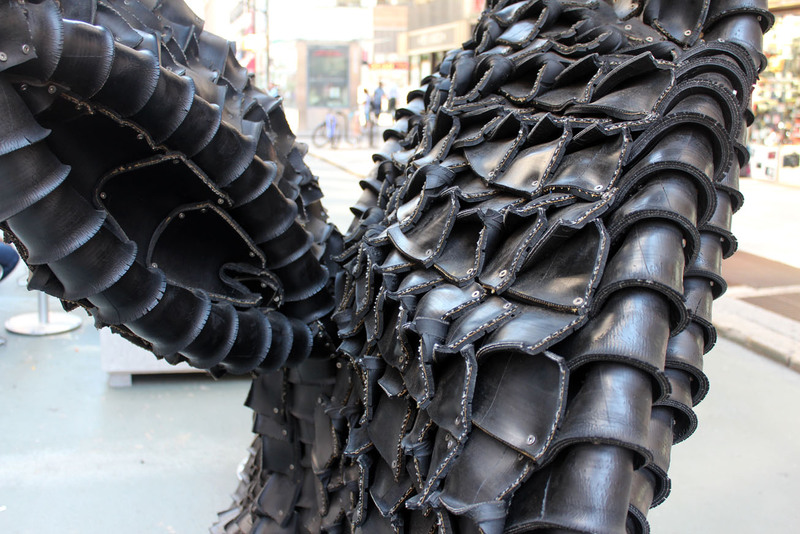 Detail of “LBD Duty Free,” 2014 rubber tires and stainless steel).